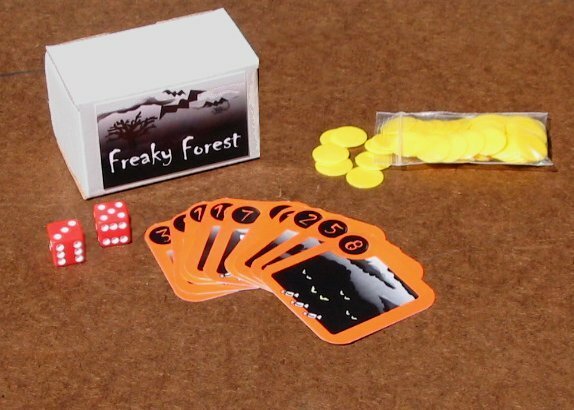 Perfect for Halloween parties, it's a spooky trip in the dark woods for 3 to 6 players. After an evening of trick-or-treating you all take a shortcut through the scary woods by your homes. In a fright you lose your candy. Will you venture far back into the forest and retrieve lots of candy or will you get scared and lose it again? Each turn you'll have to decide how far to go. In the end the one with the most candy wins! Freaky Forest is this year's push-your-luck game with a holiday theme from Mike Petty and family. Rules are included for fun variations including playing for candy and how to use the game to give out gifts at a party.